Taking a client-centric approach to wealth planning, we provide custom solutions for every step of your life. We help you build, preserve and transfer your wealth with clarity and confidence. We are dedicated to building deep and caring relationships with you and your family. The bond we form is fundamental to our mission and it is our hope that it spans generations. Our goal is to be the last financial advisory team you will ever hire. We believe you are entitled to the best advice possible. As a result, we often collaborate with colleagues from across Morgan Stanley, as well as other professionals within the industry who are considered experts in their fields. We work closely with your accountant, attorney and other trusted advisors to gain the precise knowledge needed to effectively manage all aspects of your wealth. Our goals-based approach identifies and implements appropriate solutions – from portfolio management and retirement planning to risk management and banking services. Through each step, we provide objective advice and investment insights to construct a wealth management plan that is uniquely yours. Financial education is a vital element of our practice and helps ensure continuity as wealth moves from one generation to the next. We believe it is our responsibility to assist you and family members as they face important financial challenges. We are here to answer critical questions that may impact the long-term wealth of your extended family. We are a team of seasoned professionals who have only ever worked for one firm, Morgan Stanley. This rare tenure enables us to build longstanding relationships with the firm’s senior leaders, providing our clients with immediate access to the full scope of Morgan Stanley’s intellect and global resources. In a world where people move around all the time, our loyalty to our firm demonstrates the loyalty we show our clients every day. Financial education leads to better understanding of how to manage your assets and protect your family. Throughout the year, we host a number of activities that focus on all aspects of your life. Our ultimate goal is to help simplify your life and strengthen your family’s financial security. We look forward to seeing you at our upcoming events. Please check back regularly for updates on additional activities we hold throughout the year. Secure Your Privacy - Go Green and Go Digital with Morgan Stanley Online Suite! Gather all your old bills, taxes, financial statements, annual reports, receipts and other sensitive documents for free, secure shredding by Iron Mountain's on-site mobile shredding unit. In addition, come enjoy refreshments and light hors d' oeuvres while learning about Morgan Stanley's comprehensive online suite. Save time and trees by enrolling in Morgan Stanley Online! Ask your Advisor for details. At The Perrone Lewis Group, we are a closely-knit team of seasoned professionals. We value loyalty to each other and to the individuals, families and organizations we serve every day. We have deep roots in our community and a deeper commitment to sustaining its character for future generations. Through a variety of collaborative efforts, we are highly engaged in creating a better and brighter future. Our partnership with various local and national organizations supports important initiatives and causes ranging from disaster relief and human rights to helping children, the homeless and the disabled. Morgan Stanley’s culture of global citizenship is something we embrace locally by leveraging our global resources in the communities where we do business. The firm invests in children’s health initiatives along with education, diversity and cultural programs that better our people and society. We are proud to be members of the Morgan Stanley family and carry on the firm’s philanthropic tradition. Scott is a Certified Financial PlannerTM (CFP®), Financial Advisor and founding partner of the Perrone Lewis Group. He enjoys helping successful individuals, families and business owners solve their financial challenges. His results-driven approach includes the development of a tailored wealth plan and a commitment to ongoing education and outstanding service. Scott works closely with his clients to simplify their lives, so they may enjoy their wealth and leave the legacy they desire. Growing up in Lansing, Scott learned first-hand the joys and challenges of being an entrepreneur from his parents who ran a successful plumbing business in town. Their efforts inspired him to want to own his own business as well, but Scott wanted to build a business from scratch that highlighted his strengths: finance and helping people. After graduating from Saginaw Valley State University (SVSU), Scott began his wealth management career at Hilliard Lyons in 1999 and has never looked back. Over the years, Scott has built a successful practice advising families on how to better understand and manage their total financial picture. Through a goals-based process, he works diligently to provide clients with clarity and confidence about their finances. Scott receives great satisfaction knowing he is making a significant impact on the quality of their lives, which is what he loves most about his profession. Scott’s passion for helping clients is equaled only by his dedication to his family and community. He and his wife, Jaime, currently live in Charlotte with their two children. Scott and Jaime are very active in a number of organizations, including JDRF, ADA, Coaches vs. Cancer and Blessing in a Back Pack. They also enjoy spending time with their children riding bikes, skiing and being outdoors. Scott continues to play basketball, a sport he excelled at SVSU. Today, he is the coach of the boys’ basketball team at Grand Ledge, an experience that brings much joy to his life. A skilled wealth management professional, Stephen enjoys working with financially successful individuals and families, providing highly personalized advice through a disciplined approach. His experience and knowledge enable him to help clients understand the intricate details of their wealth. He focuses on listening carefully to what is most important to each family, so he can develop a customized plan that is designed to address their unique goals and circumstances. Stephen was introduced to the world of finance by his Uncle Joe. A hard-working and successful Financial Advisor, Joe took pride in helping clients achieve their financial goals. Joe encouraged Stephen to consider a career in wealth management and after graduating from Western Michigan University, where he earned his degree in Business Administration, Stephen soon joined Morgan Stanley. Shortly thereafter, Stephen became a partner with Joe, his sister Anna, and Scott Lewis, officially forming The Perrone Lewis Group. Together, they have built a successful and dynamic practice, serving clients locally and around the country. Stephen’s results-driven process begins with asking the right questions and actively listening. This information then serves as the foundation for the development of a comprehensive plan and investment portfolio that reflects each client’s goals for the future. Stephen focuses on creating long-term, trusting relationships to help his clients simplify their lives, so they may enjoy the wealth they are creating. Stephen and his wife, Tara, live in Lansing with their baby daughter, Sophia Grace, and their yellow Labrador, C.J. A sports enthusiast, Stephen enjoys basketball and travels throughout the summer to play in weekend tournaments. He is also a big supporter of Detroit and Michigan sports and loves to get in as many rounds of corn hole when he can. He enjoys spending quality time with his family and sharing his passions with his daughter as she develops her own interests. Anna has dedicated her entire career to serving the specialized needs of successful professionals, business leaders and families living in the greater Lansing area and around the country. A founding partner of the Perrone Lewis Group, she leads a team of seasoned professionals, who work together to develop tailored strategies to fit each client’s personal circumstances. Her mission is to empower clients to be confident in their financial decisions, so they have the financial freedom to pursue their hopes and dreams. While earning her Business Marketing degree at Michigan State University, Anna joined Morgan Stanley as a summer intern, working for her Uncle Joe (who is now retired) and learning the ins and outs of the financial services industry. As she took on more responsibility, she worked more directly with clients. It was this experience that inspired her to follow in her uncle’s footsteps and become a Financial Advisor after graduation. She has been guiding clients ever since, listening to their personal stories and helping them “fix” the issues that stand in the way of achieving financial success. Anna takes great pride in her ability to put advanced concepts into action and effectively communicate these concepts to clients. She is responsible for managing the team’s service model and ensuring every client receives an “A++” experience. She also organizes the team’s educational events and workshops, providing ongoing learning opportunities on relevant topics of interest. A strong believer in giving back, Anna is active with Susan G. Komen and 100+ Women Who Care. Family is also a top priority. 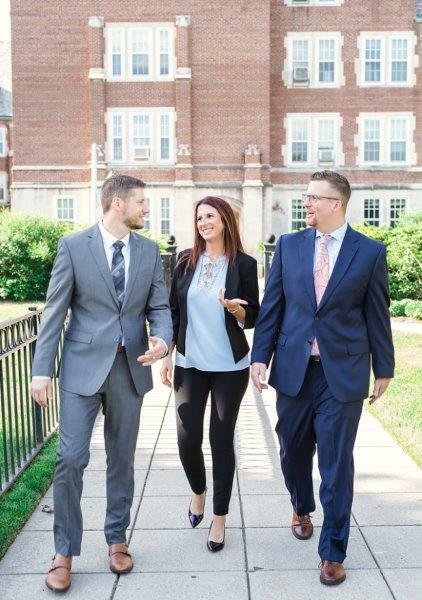 Growing up with five siblings, Anna now works with her brother, Stephen, and sister, Sarah, and the entire Perrone Lewis team, who has built solid bonds over the years that cannot be broken. Anna and her significant other, Elijah Pitts, are expecting their first child in July, who they can’t wait to introduce to their fur baby, a lovable Rottweiler named Attila. Jennifer Edwards, a Portfolio Associate with Morgan Stanley for 15 years, earned the 2008 and 2009 ACE award for her volunteer work. As a native of Eaton Rapids, MI., she is active with The American Cancer Societys Relay for Life and other charitable organizations. Ready to start a conversation? Contact The Perrone Lewis Group today.